Range of Motion (ROM) and Stretching are used to flex and extend joints that not being used appropriately due to injury or surgery. ROM exercise and stretching should be done as directed by a pet rehabilitation professional. By performing ROM we keep the joints lubricated, reduce muscle atrophy (wasting away) due to disuse, and speed the healing process. Balance exercise allows for use of muscles that the patient may not be using appropriately due to pain or surgery. Strengthening exercises are often used as healing occurs. 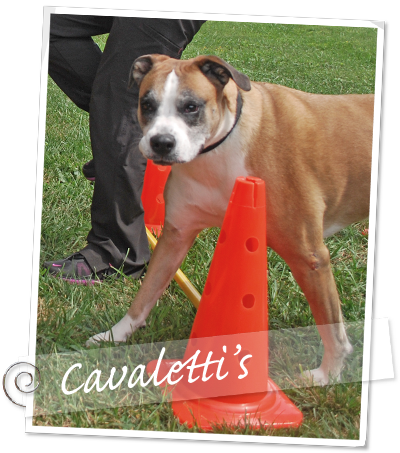 Strengthening helps pets to maintain weight bearing tolerances, as well as to improve endurance and coordination. A variety of equipment is utilized as part of an overall recovery/strengthening program designed to improve stamina and agility. Electrotherapy is often used when the pet's pain reduces their ability to move specific muscles. 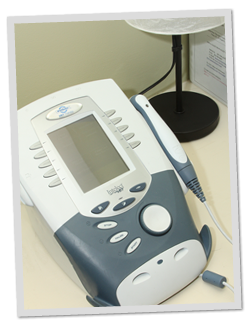 Electrical stimulation, or e-stim, soothes aching muscles, treats spasms, pain, and edema, and decreases atrophy. Electrotherapy uses electrical nerve stimulation to reduce swelling (edema) and increase circulation (blood flow) to the affected or injured area. The reduced swelling allows more blood to rush to the areas that need healing. The increase in blood flow allows oxygen, nutrients, and healing cells to travel to the injured area faster to repair the damaged tissue. Therapeutic ultrasound works via sound waves. The energy from these sound waves can penetrate into the muscle layers warming the muscles. This deep tissue heating aides repair tight or sore muscles as well as sprains and strains that the pet may not otherwise allow. Kim & Becky really know their stuff. They bond with the dog and the owners ensuring excellent personal service. They meet their goal of enabling the owners to work with their furry friend at home. Not only has 2 yr. old Raven succeeded in overcoming a muscle strain but the exercises have done wonders for our 10 yr. old Lab as well. We're so glad they were referred to us. Love this place. They have been working with Dew for 3 months. He loves the attention and the pain relief he gets here.